Whip up a super-fast half-sweater to keep your dog warm this winter! 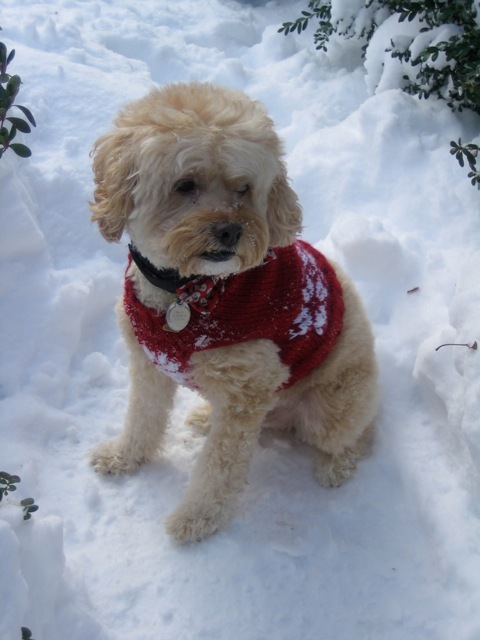 Snowflake colorwork motifs make this a dashing addition to your pet’s wardrobe. Sized for smallish dog, 22″ around at largest chest measurement, but includes suggestions for resizing. I have made two of these for Henry, my mini long-haired daschund. He loves them! I’m so glad you like the pattern, Donna! I’d love to see pictures if you’ve got them! Yes, it could easily be lengthened. The back is just a rectangle, so you can add more stockinette rows above the snowflake motif to make it longer. Keep track of how many extra rows you add, and then knit that many more rows of stockinette (in addition to the 10 rows the pattern calls for) on the underside before starting the decreases for the chest area. Let me know if you have any more questions! Hello, do you have a version of this beautiful sweater without the snowflake pattern? I am only new to knitting and don’t think I’m ready to tackle the snowflake work. I love this doggy sweater and I want to make it for my Bichon Frise but I would love to find a similar pattern for myself as I have seen these sweaters in the fashion magazines. I wish knitting pattern companies would keep up with fashion a bit more. Knitwear is huge at the moment but I struggle to find trendy patterns that reflect what is in the shops. I feel loathe to buy anything I could knit myself! Hi I was going to start this super cute sweater but couldn’t figure out all your acronyms I know CO means cast on and K1 is knit 1 etc but there are a few I don’t know. IF you could please help me out there I would appreciate it! Thanks. The local SPCA put out a call for small dog sweaters. The weather here in Buffalo NY can be hard on little critters. This pattern is perfect. Thank you for desigining it. Love the sweater. Was looking for one for my dog and when I found this one I couldn’t resist. Your dog looks just like mine, so I have no doubt what it will look like on her – this it definitely the right sweater for Bentley. I need a dog sweater for Border Collie. They arw 26″ from neck to tail. I could figure out how to enlarge a pattern a size or two, but going from small or medium to that large boggles my mind. Does anyone know where I can get some help. I already know about the greyhoud where one puts in all kins of mesurement, but the dogs don’t live with me and the sweater are to be a surprise, Not to mention that I cannot figure out some of the measurement. I would like to know how much the sweater is. it’s free! just click the link underneath where it says “download PDF” on this post above. Arrrhhh i have knitted the back and have just noticed the front pattern is missing from row 1 to 30 when i download the pdf 😦 is there any chance you could send me the pattern please? I was making a sweater for my small dogs but i stopped cuz I do not understand the leg part but with this pattern I hope I will be able to finish it. Thank you. The snowflake dog sweater is certainliy cute, but if one doesn’t make it a lot longer, what’s the point? It barely covers his front half. It should go on down to the tail on ttop and under him from the back of the front legs to the front of the back legs, Unless, of course, it’s purely for show. Hello, do you have a version without the snowflake design? I am new to knitting and don’t think I am experienced enough to tackle the snowflake design. This is so cute, I love this sweater with it snowflake motive! Spectacular web-site. Plenty of handy information and facts the following. I am just transmitting this to several mates ans likewise giving throughout tasty. And definitely, thanks a lot for a attempt! Like Sherrie, I was looking for a dog coat pattern and this one appealed the most to me. My little dog is very much like Max, so I’m sure it’ll work. I’ll do a couple once I know I have the measurements right, and lengthen them. I have some knitting experience and had no trouble reading the pattern. Thank you very much for making it available. Working on your dog sweater but do not understand what you mean by pm at the start of the snowflake pattern on the belly. Please let me know what pm stands for. pm = “place marker,” as in add a stitch marker to help you keep track of the pattern.